Where high50.com leads, so Prince Harry follows. The day I return from island-hopping in the Caribbean, so HRH heads out. His trip is billed as being ‘formal but fun’ but I’m sure there’ll be less of the former and more of the latter as the party prince represents his grandmother, the Queen, on a tour that coincides with three Caribbean countries celebrating major independence anniversaries. Prince Harry will certainly find a warm welcome as he hops between Antigua and Barbuda, St. Kitts and Nevis, St. Lucia, St. Vincent and the Grenadines, Grenada, Barbados and Guyana. Happily for him, he won’t have to rely like I did on the appalling local airline, LIAT, the Leeward Islands Air Transport known to its long-suffering passengers as either Leaving Island Any Time or Luggage In Any Terminal. LIAT aside, though, this is a glorious part of the world to visit and there is no shortage of fine places to stay. Here are my five favourite hotels and resorts on the islands Prince Harry will be visiting. There are supposedly 365 beaches on Antigua, one for every day of the year, and Curtain Bluff sits on a rocky bluff, flanked by two on either side. There are 72 rooms and suites here, two restaurants – the Tamarind Tree and the Seagrape – and what is supposedly the largest and finest cellar in all the Caribbean, stocked with over 400 different wines. Included in the room rate are such activities as snorkelling, scuba-diving, water-skiing, kayaking, paddle-boarding, tennis and squash. Pay extra and you can visit the excellent spa or enjoy Caribbean cooking classes and wine tastings. If you fancy an fascinating jaunt, visit Nelson’s Dockyard and raise an ice-cold rum punch to the great man himself in the Admiral’s Inn. Not so much a resort, more a selection of secluded white-washed, thatched self-catering villas (2, 3 or 4 bedroom), each with its own private pool, terrace and fully-fitted kitchen, clustered by the water’s edge on the north west of the island. With incomparable butler service from Mona (email her before you arrive and your fridge will be stocked with all you desire), a beach bar manned by the marvellous Mervan (his rum punch is a thing of wonder), warm, fluffy sand underfoot and gorgeous far-reaching views of St. Kitts, it’s a very special place and no mistake. Oh, and you are also but a 20 minute stroll along the beach from Sunshine’s, home to the notorious Killer Bee cocktail. East Winds is a discreet spot, tucked away in La Brellotte Bay, Gros Islet, on the north-west coast of the island, not too far from the capital Castries. 30 cottages are dotted around delightful palm-fringed, bird-rich tropical gardens and there is an open-to-the-elements clubhouse bar, a sunset bar and a pool bar, so it’s fair to say rum-lovers and other drinkers are well catered for. For an all-inclusive resort, the food is jolly good and the location right on the beach, unbeatable. And there is much to do nearby, be it climbing to the top of Pigeon Island, riding and swimming with horses at Trim’s Riding Stables or enjoying the Rhythm and Rum tour at the local distillery. If there is a warmer, more genuine welcome to be found anywhere else in the Caribbean than here at this all-inclusive boutique resort owned and operated by Sir Royston Hopkin and his family, then pray let me know. 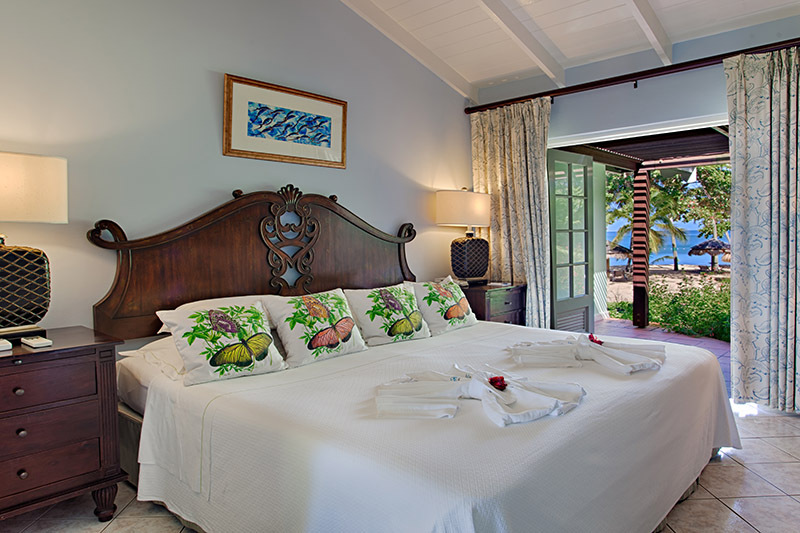 Situated slap-dab on Grand Anse Beach, Spice Island boasts 64 separate suites/villas, some with their own pools, others opening straight onto the beach, all with absurdly comfortable four poster beds and proper feather pillows. There is fine food in the restaurant, Oliver’s, plus cocktails at the poolside bar, a well-accoutred fitness centre and an excellent spa. It’s the nothing-is-too-much-trouble staff, though, which makes Spice Island Beach Resort such a joy to stay in. The oldest continuously operated hotel in the Caribbean (it was founded in 1887) might seem to be somewhat out on a limb and away from the action in the south east of the island, but there is no shortage of things to do. The Crane boasts bars, shops, a kids’ club and several restaurants (including the celebrated Chinese/Japanese restaurant Zen) not to mention the famous Crane Beach below it, regularly voted one of the ten best in the world. The self-catering suites are remarkably well laid out with fully-fitted kitchens, dining and sitting areas, vast bedrooms, bathrooms and shower rooms. And if you enjoy your stay that much, you can even buy the suite you stay in.